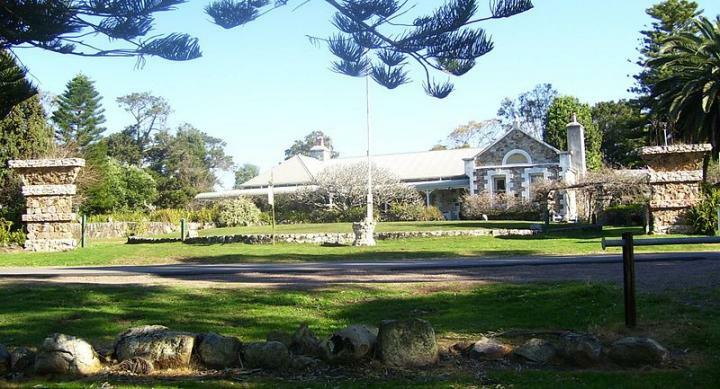 The centrepiece of this small town is Tanilba House which is one of Australia's oldest buildings. In 1831 Lieut William Caswell, Royal Navy, received a land grant of 20.2 hectares (50 acres), along with an assignment of convicts who cleared the land and built Tanilba House from locally quarried stone. Ten acres (4 hectares) on the eastern side of the hill was used as a vineyard soon after the house was built. An olive tree planted in the vineyard survives to this day. In 1931 Tanilba House was owned by Henry Halloran who designed such structures as "The Temple", which is behind Tanilba House on the road leading to the house, and the elaborate gates at what were then the north and south entrances to the town. Today the town has expanded and the still incomplete gates stand inside the town limits. Tanilba House is surrounded by houses. It was proposed that the Prime Minister of Australia would live here until Canberra was settled. Barb Walker not a bad site Trevor. I like the map section too.